Jewish tradition offers a dynamic tool for interpreting the Bible: black fire and white fire. The words themselves are black fire, handed down from generation to generation. White fire is the space between words, the place where readers use their intellect, creativity, and personal experience to better understand and assimilate the text. In the new Common English Women’s Bible, there is much white fire—and from an unexpected and most welcome source: eighty-plus women from primarily mainline Protestant denominations. Seminary professors, pastors, congregational leaders, and several novelists all contribute, successfully, to the goal of helping Bible women be more accessible in Scripture. And indeed those Bible women light up the text. In dozens of character sketches, sidebars, and reflections, there exists a certain freedom that is all too often missing in contemporary saccharin-sweet books about Bible women. Rather, the writers help set each woman in her nuanced context, bringing theological, historical, and ethical considerations into play. Women have always been present in Scripture, of course. But here they rise to the surface, ready to share their lives, struggles, and accomplishments with us. In addition to the profiles on women, each book of the Bible sports an introduction, as does each chapter of the Bible. Comprehensive indices at the back put in place a thorough platform in which to look up individual women as well as themes. Finally, we have in place the whole Bible, and a plethora of key information about most of the women in the Bible, in once place. And it’s about time. This book would have been quite helpful on a national research project I coordinated from 2011-2014: identifying, documenting, and profiling all the women who are recorded as having spoken in the Bible. Surprisingly, that work had never been done before, and culminated in the publication of Bible Women: All Their Words and Why They Matter, published by Forward Movement. Our team scoured books, websites, journals, and articles to find answers. 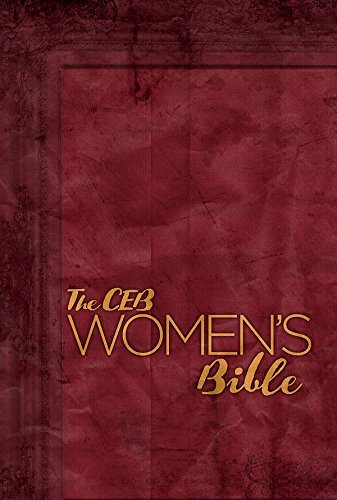 Had the CEB Women’s Bible been available then, we would have immersed ourselves in it. Thankfully, it’s never too late for such a rich resource as this. I commend it to you.